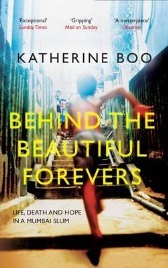 Behind the Beautiful Forevers: LIfe, Death and Hope in a Mumbai Slum by American writer Katherine Boo is a remarkable book that reads like the best of fiction despite being founded in fact. I read it the whole way through without realising that it wasn’t fiction which is probably testimony to the page-turning quality of her writing. I’ve not seen a non-fiction book about India quite so astonishing, amazing and insightful since Dominique Lapierre and Javier Moro’s ‘Five Past Midnight in Bhopal’. Bearing in mind that the latter is one of the best books I’ve ever read, then you can take it that I’m seriously impressed by Behind the Beautiful Forevers. We start with a death. It’s July 17th, 2008, and in a small hut in Annawadi slum on the periphery of Mumbai’s International Airport, a spiteful woman’s plan to upset her neighbours goes badly wrong. The one-legged woman called Sita is sick of the banging noises from next door where her neighbour Zehrunisa’s son Abdul has been building a new kitchen shelf for his mother. For crazy reasons best known to herself, ‘One-leg’ sets light to herself, planning to extinguish the flames and blame the neighbours but she gets her timing wrong, or uses too much fuel and goes too far. Taken to the hospital she makes her deathbed statement that the neighbours did it to her and then, in great pain, she dies. The book opens with the police about to visit the slum and Abdul burying himself in a mound of rubbish that he’s storing in the family’s storeroom. The book follows three families. The first is Sita and her family. Whilst she’s badly disabled, she has voracious sexual appetites and entertains gentlemen callers in her hut whilst her cuckolded husband is out at work. She makes up for her deformed body by exploiting one part of her body that’s still in demand. After her accident, her husband can see plenty of potential to make money and gain advantage from prosecuting his claims against his neighbours. The second family is the accused neighbours. Mother Zehrunisa has nine children, a loving husband and children who make her proud, especially young Abdul whose business helps support a better life for all the family. They are a Muslim family in a predominantly Hindu slum and their success attracts the envy of other slum residents. Abdul has a talent for rubbish, sifting and sorting, buying and selling the detritus of Mumbai’s daily life. The police need someone to blame, and soon have Abdul, his soon-to-be divorced sister, and his father in custody for One-leg’s killing. The final family is slum-royalty. Asha aspires to be the slumlord, the first woman to hold that position. She’s learned that the way to wealth and influence is via doing favours for which people will pay. She knows all the right people, how to get the results they need, and how to gain personal power through her connections. She’s connected to the local Shiv Sena group, the Hindu nationalist party which wants to drive other religious groups out of the area. Her daughter is a genuinely kind and caring individual who runs schools for the slum children but can she stay good when her mother’s such an evil character? I love to read books ‘in situ’, especially books set in India and if ever there has been a city to inspire great writing, then Mumbai is probably that city. The very first time I visited Mumbai, I stayed in a hotel near the airport with its own little slum next door. In my suitcase was a city guidebook and a copy of Leslie Forbes’ book ‘Bombay Ice’. For many years, most of what I knew about the city came from that novel and certainly far more than I learned from the guidebook. On our first morning in Mumbai we went to the airport for our flights to Bagdogra in West Bengal and we found ourselves sitting in the plane, waiting a good 20 minutes in the take-off queue. We were treated to exceptional views of one of the airport’s many slums. It was not Annawadi, the slum of Boo’s book, since that’s long been leveled by the bulldozers, but it was almost certainly very similar. As the pilot killed time, I watched scores of poor slum people stroll out of their huts with their cheery bright blue tarpaulin reinforcements (all tarp in India seems to be this same jolly shade of blue) and head to the field on the edge of their slum to do what needs to be done first thing in the morning. Al fresco peeing, pooing and various ablutions were there for all to see. I admired the balance of one particular chap who appeared to have perched on the edge of a flyover, doing his best onto the traffic below. Classy! Indian slums are fascinating. I don’t mean that to sound flippant but there’s a lot of inspiration to be found in the ability of the country’s poor to eke out an existence on the scraps of society’s waste. Many’s the time I’ve seen children emerge from a slum in perfectly pressed pleated school uniforms and neatly tied plaits, spotlessly clean despite their basic surroundings. Mind you, that triumph of determination over surroundings can’t hide that life in such places is dangerous, unhealthy and horribly risky. Annawadi is plagued with all sorts of problems. From the sewage lake on the edge of the slum, to the violence of everyday life, the jealousies and politics of slum existence, there’s nothing easy about living in a slum. Boo tells us of the random killings of slum dwellers, a man dying slowly by the side of the road, a small boy killed and his body dumped in a bush. The only thing worse than life in the slum is life in the prisons where Zehrunisa’s family are incarcerated. Katherine Boo is a Pullitzer Prize winning journalist who specialised in writing about poor American communities. When she married her Indian husband, she found a new level of poverty to investigate in her new husband’s country. Despite not speaking any of the local languages, she spent nearly 4 years in Annawadi interviewing the residents of the slum, getting to know about their lives, their dreams, their disappointments and following the three families at the centre of her book. She had translators with her, she made audio and video recordings of her meetings, along with copious notes. That material turned into Behind the Beautiful Forevers. The title – for those who need to ask ‘why’ – comes from an advertising hoarding that hides the view of the slums from drivers arriving at the airport. It promotes Italian floor tiles with the words ‘Beautiful Forever Beautiful Forever Beautiful Forever’ and Annawadi is literally behind the ‘Beautiful Forevers’, far from beautiful at all. I read a lot of novels and non-fiction about India and this is one of the most moving non-fiction books I’ve found in a long time. I honestly thought it was fiction until I reached the end and read about Boo’s research. Yes, there are signs of a non-fiction source in the way that things do rather fizzle out at the end, but there’s so much action that it’s a shock when you realise that the deaths, the suicides and the despair are real and not just literary invention. For this to have been written by an outsider, an American who couldn’t understand the language of the slum dwellers but knew the language of their hearts is truly remarkable. What’s also remarkable is that despite the death and disasters, there really is still hope in this story. Life, death and hope – but the greatest of these is hope. No Comments on "Behind the Beautiful Forevers: Life, Death and Hope in a Mumbai Slum"